[By Nick] This I unusual for me because I don’t normally crave banana flavored products. Lately though, I’ve been wanting them more and more. Seeing as I’m still on my mission to review every Ben & Jerry’s product available, I decided to revisit one of their best sellers: Chunky Monkey. Before trying Stewart’s Monkey Business, this was my go to for banana cravings. That said, it’s been years since I’ve had it so who knows if my taste buds or their formula has changed. Quick Note: Ben & Jerry's Chunky Monkey ice cream has recently received the new fair trade packaging update but the ingredients and nutritional info have remained the same. There are no surprises with the way this one looks. 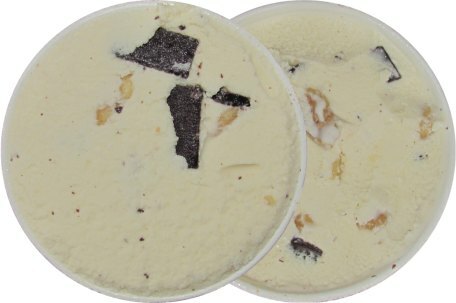 The description of banana ice cream with walnuts and fudge chunks holds true with what you see. While not as natural (albeit, overripe) as Talenti or Haagen-Dazs, Chunky Monkey doesn’t have that artificial taste that most banana flavored products suffer from. Since I’ve been trying a lot of banana ice creams as of late, I have to say the base of Chunky Monkey is one of the better ones. Where this one suffers though is the mix-ins. I’m sure most of you are familiar with B&J’s fudge chunks so I won’t elaborate on their taste. It’s as basic as chocolate can be. For some reason, these chunks seem to be a lot harder than usual. I’m not sure if that’s on purpose but you need to let this soften up a bit unless you like visiting the dentist. That leaves the walnuts. Suffice to say, I’m not the biggest of fans when it comes to them. They’re not all that bad but there’s just so many other nuts I prefer. The positives are that they’re really fresh and way softer than the fudge chunks. My main gripe is that their flavor isn’t strong enough to hold its own. It easily gets lost between the more potent banana and chocolate flavors. Now had they gone with different nuts, such as peanuts, I could see this flavor being more than average. As is though, I’d easily pick up Stewart’s Monkey Business before giving this one another chance. I've never understood why this flavor is so popular. I guess I'm just more of a boring Joe Vanilla type of guy. 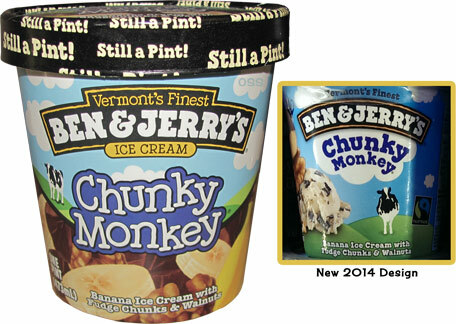 Chunky Monkey has always been one of my favorite B & J flavors, followed by New York Super Fudge Chunk. I'd rather not have any nuts in it though and just stick with the chocolate chunks (which I always save to eat last anyway). You're not alone, Stride. I'm not sure how this flavor and cherry garcia remain top sellers with all of the better options out there. You have to use walnuts because that's the nut of choice for banana bread. That is the flavor this ice cream is going for. Peanuts would totally change that. Ibagoalie, I don't think they were going for banana bread. When was the last time you had banana bread that had chocolate chunks? Also, walnuts seem to be more prevalent in banana cake, not bread.